What do you do to stick to your New Year’s Resolution all year? Do you need tips for keeping New Year Resolutions? New Year’s Resolutions have gotten a bad name over the years. Hardly anyone seems interested in making New Year’s Resolutions, and if they do, they do so knowing they have no hope of making their resolutions stick. Keeping your New Year Resolutions? What’s that! Why are New Year Resolutions Important? Make Sure Your Resolution is R.I.G.H.T. Take the Quiz – What Should Your Resolution Be? So, it’s also not surprising that with 80% of New Year’s Resolutions are broken by February and only 8% of people achieving their New Year’s Resolutions that odds don’t exactly seem to be in your favor. Setting New Year’s Resolutions is a 4,000-year-old tradition! We’ve kept doing it for a reason – setting New Year’s Resolution is a fun way to start the new year. Don’t miss out on what could be an incredibly motivating new year tradition to help you set and achieve your goals in 2019. Yes, you read that right, the RIGHT Resolution can actually help NOT hurt your new year goals setting. If you know how to keep your resolution. Unlike what everyone else seems to think about New Year’s Resolutions, I still believe they have incredible value and are a worthwhile new year tradition. They are a beautiful way to start the new year and a potentially powerful FIRST STEP in your new year goal setting journey. The key component, being it’s the first step and NOT THE ONLY step you take to make 2019 your year. The second step being then setting achievable goals that you actually achieve as a way to make your New Year’s Resolution stick. And, of course, you’ve also taken time to choose the right Resolution that resolves a great challenge in your life too. There seems to be so much backlash against making New Year’s Resolutions in favor of setting goals as if the two can’t positively reinforce each other. It doesn’t have to be either or, you can set both! And let’s just be clear, it’s not about WHAT you call it, goals or New Year’s Resolutions, but how you approach it. You can just as easily make a new year’s goal and not achieve it. It’s not calling it “a goal” or “a resolution” that makes or breaks it. But how you approach keeping them that make it so. Whether you’re making New Year’s Resolutions or you’re setting a yearly goal and want to know how to achieve your goals this year, these 12 tips will help you. Are you stuck on choosing the right resolution? Here’s the ultimate list of unique New Year’s Resolution ideas. Resolutions, like most “wishes” we make, are often spoken or whispered at “magical” times, like birthdays or midnight on New Years. Break the curse of not following through, by writing down your New Year’s Resolution on paper. Writing it down makes it tangible and real to you. Find a piece of paper and write down your New Year’s Resolution. You can take this even more seriously by writing it nicely to be displayed in a frame or posted on your wall. You can even use it as the centerpiece of your vision board. Display your resolution somewhere you can see it daily and meditate on making it a reality. Tip #2: Make Sure Your Resolution is R.I.G.H.T. Before you even worry about making your resolution stick, you need to first make sure it’s even the RIGHT Resolution for you. You know how it is, the New Year approaches and we can get super self-conscious about our lives and end up making (and then breaking) some of the most common New Year’s Resolutions. It’s no surprise that the top three resolutions set every year all related to health and fitness: To exercise more, to lose weight, and eat more healthy. We tell ourselves we’ll stop making the same unhealthy lifestyle excuses. It’s not that there’s inherently anything wrong with these resolutions, just that they can be “shallow” because they hold no deep meaning to us nor do they align with your own true and deepest heart intentions and desires. We just think they do. RESOLVE: Does your New Year’s Resolution address your greatest challenge? INTUITIVE: Is your New Year’s Resolution a “good fit” for you and your abilities? GENUINE: Is this New Year’s Resolution you? Are you being authentic? HOPEFUL: Is the emotional sentiment of your New Year’s Resolution hopeful and positive? TRANSFORMATIVE: Is the process of achieving your New Year’s Resolution transformative to you? How? If your resolution passes this test simple test, you’re more likely to stick to your New Year Resolution. Take your New Year Resolution farther still by setting a S.M.A.R.T. goal. The one resolution you should always make is to set goals too. 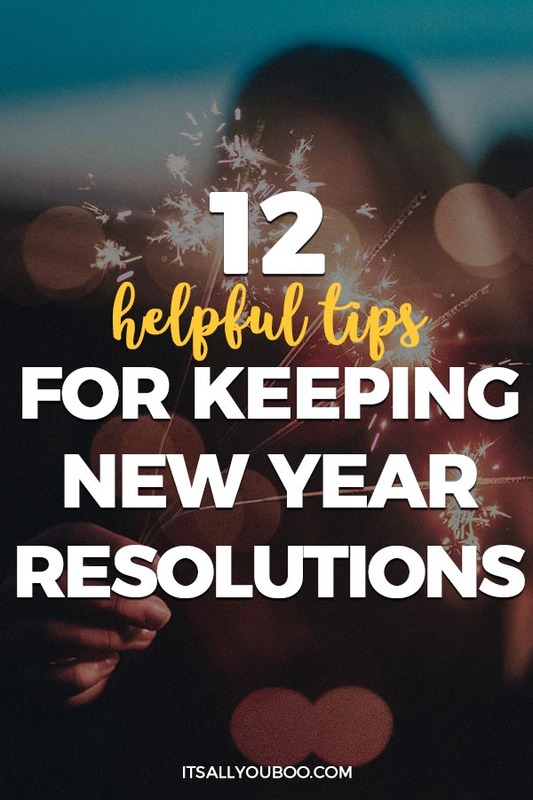 Like we discussed in Tip #1, resolutions are usually just wishes made at midnight, without any real plans, strategies or timelines for completion. Without goals to back it up, you’ll fail to make your resolutions stick. SPECIFIC: What exactly do you need to achieve? MEASURABLE: How exactly will you measure your progress and success? ATTAINABLE: What do you need in order to achieve your goal? RELEVANT: Why do you want to achieve this goal? Does it fit with your intention? TIMELY: What’s your deadline for your goal? Is it achievable? Just like the test in Tip#2, if your new year goal passes this test too, you’re doubly likely to stick to your New Year Resolution. So, make it R.I.G.H.T. and make it S.M.A.R.T. goal too! How do you stay motivated for the entire year to keep your New Year Resolution? Let me introduce you to “mini” goals, that unlike your #1 BIG goal for the year, they’re easier for you to achieve and require less time. “Mini” goals also provide measurable proof (remember that M in S.M.A.R.T.) that you’re making progress, thus delivering that much-needed boost of confidence that you can reach your BIG goal (and consequently making resolutions stick too – a happy side effect). Deconstruct your New Year’s Resolution (now a R.I.G.H.T. and S.M.A.R.T. goal) even farther, into smaller goals that you have to meet before you reach your end goal. Set these up as milestones on your way to success. For example, if your big goal is to start a profitable business in 2019, rather than just having this one goal you would decide what milestones you need to hit each month. Some mini goals for starting your own business could be, saving seed money, writing a business plan, creating a website, networking or landing your first client. Yes, each of these goals can be deconstructed further, but they’re already way much more achievable than your larger goal. Without a deadline, it’s just a wish. And remember, we’re now setting goals, not making wishes. You can easily transform any wish (without fairy godmothers or clovers) into an achievable goal by giving it a specific and firm deadline. An end date or due date for success forces you to figure out practically speaking HOW you are going to achieve this goal. Select your goal and give it a deadline. Then, strategically plan your way from the end goal, step by step, to where you are now. How much time is realistic? And please avoid the tendency to say by the end of the year. Set “mini” goals and milestones for each quarter or whatever time frame makes sense for your goal. Give each mini goal its own timeline (more on this in Tip #4). It’s difficult to stay motivated for the entire year, without any signs of success. That’s where tracking your progress and quick wins come in. When you’re able to see in black and white that you actually are making progress, you get excited and motivated to keep going. On the other hand, a lack of progress can be one of the biggest motivation killers. Once you start building momentum you’ll be keeping your New Year’s Resolutions. This is where the M, in SMART goals comes in. It’s not for motivation, but for measurable. Figure out your unit of measurement for your S.M.A.R.T. goal. Then start keeping track of your progress in a notebook, spreadsheet or document. Update it daily or weekly, however often you work on your goal. Some ways of measuring progress include finances (money earned, saved or debt reduced), consumption (what you ate or drank), or time commitment (how many hours, minutes or days). Your goal determines how you’ll measure your progress. Don’t worry about making it through the entire year, just focus on making it through today and this week. With the start of the new year, 12 months can seem like a long time to stick to your resolution. But, what seems like a year of possibility, can easily feel like a year-long jail sentence. The solution is to stick to your New Year’s Resolution for one week at a time. Start thinking of your resolution or goal as a weekly commitment. What do you have to do today, tomorrow and only this week to stick to your resolution? If you want to save $10K in 2019, how much do you need to save this week? Focus your energies on not overspending in your present and let the rest of the 12 months be a concern for later. As time goes on and the initial excitement wears off, it gets REALLY HARD to keep your New Year’s Resolution. One of the best-kept secrets is creating a system of rewards and celebrations for meeting your “mini” goals. Hit a major (or even a minor) milestone, awesome, let’s celebrate! By rewarding yourself, it becomes more about getting to your next reward, and less about all you have to do the get there. Having a positive reinforcement for sticking to your New Year’s Resolution can encourage you to keep going, even when it gets hard. Create a system of rewards and celebrations as you stick to your New Year’s Resolutions throughout the year. When you hit your “mini” goal, give yourself permission to enjoy yourself. Rewards can include cheat days, date nights, movies or whatever it is you enjoy (but doesn’t harm your progress towards achieving your New Year’s Resolution too much). When goal setting fatigue sets in you’ll want to skip, not do it and start doubting why you ever picked this resolution or goal for yourself. From day one, you should build in some internal accountability by keeping a journal or using a goals planner. By writing it down on paper you’re more likely to stay on track. And bonus, you’re also making measuring your progress (remember tip #6) that much easier. Pick up a pretty new bullet journal or planner and start by writing down your New Year’s Resolution, S.M.A.R.T. goal and “mini” goals. Then, daily record what you’ve done to reach your goals, list goal-related to-dos you’ve crushed, and anything about your goals. You can also do this in a Google Doc, EverNote or whatever works best for you. One of the most common goal setting mistakes and reasons why New Year’s Resolutions don’t stick is that we never tell anyone! We keep it to ourselves and then when we feel like quitting, there’s no one there to push us on. You MUST add in some external accountability too! Recruit your cheering section to help you make your New Year Resolutions stick. Share your New Year’s Resolution and goals with your family and friends asking for their support and encouragement. Check in with them regularly and reach out to them when you feel like giving up. You can take this up a notch by making a public declaration on social media, a blog or YouTube channel. It’s amazing how not wanting to disappoint your family, friends or followers can keep you on track. Do you know someone who has made the same New Year’s Resolution or yearly goal as you? Perfect, let’s make it official by making them your accountability partner. One of the best ways to make your New Year’s Resolution stick is to have someone with the same challenges, dreams, and hopes as you, by your side. Start reaching out to your friends and family (which you’re already doing in Tip 10 right!) and see if anyone has a similar goal as you. If you can’t find an accountability buddy in your immediate circle and reaching out in Facebook Groups or other online forums. No fancy proposals needed, simply ask if anyone would be interested in being accountability buddies and checking in once a week. Set goals with each other for the next week, then on your call check in to see how you did. Also, share best practices, resources, tips and habits for success. 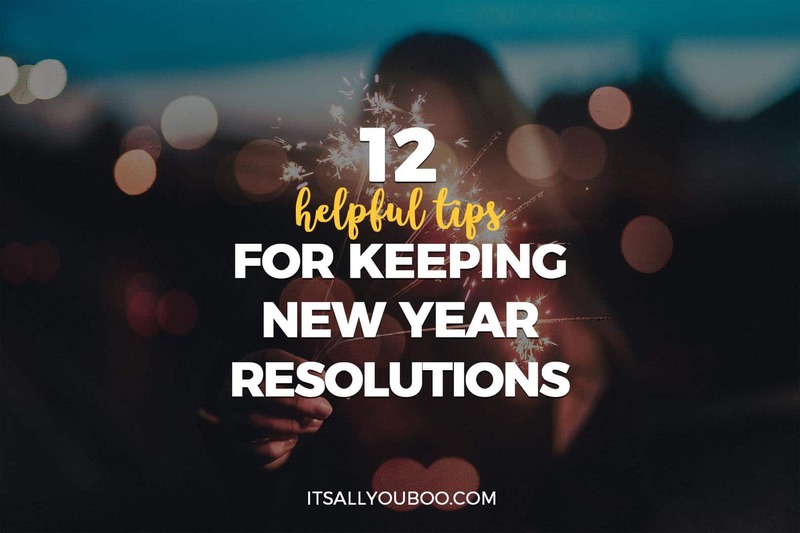 Rather than seeing all the “mini” goals and to-dos that you need to accomplish this year to meet your New Year’s Resolution, focus on forming a new habit that makes accomplishing your goals easier. With repetition and rhythm creating the space and time to work on your goal becomes second nature. Soon you won’t even struggle to get started, you just will because you’ve been doing it for weeks and months. Habits make New Year’s Resolution stick by making it your “new” normal. Create new habits by first choosing a specific time and place for making resolutions stick. Maybe it’s every Sunday after your favorite TV show or every Tuesday after the gym, in your office or your favorite coffee shop. By creating a schedule for yourself, you fall into a natural rhythm. Track your new habit using a daily habit tracker. For example, if your goal is to eat healthily, change where you shop, which grocery aisles you walk down – maybe you’ll go through the veggie aisle and walk past the junk food. The first time is hard, second time easier and before you know it you won’t even see what you can’t have. Focus on creating healthy habits! Take the Quiz – What Should My New Year’s Resolution Be? Now that you know how to stick to your New Year’s Resolution, are you ready to make your 2019 resolution? 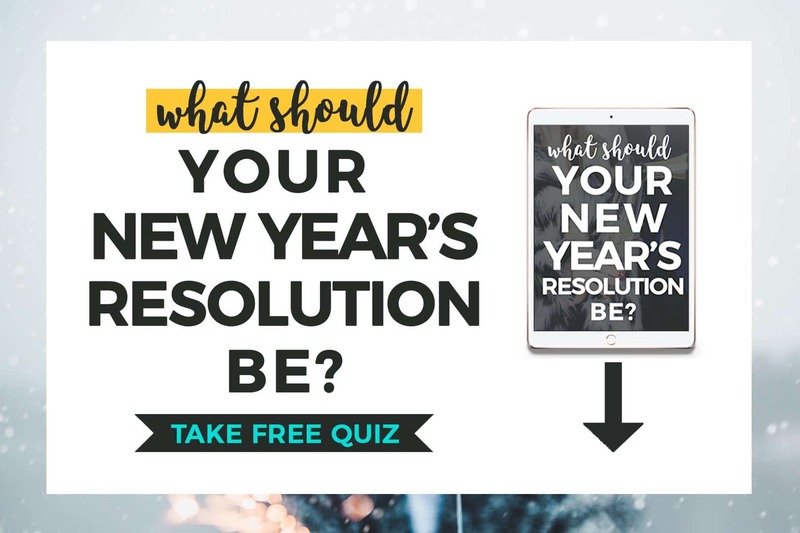 The New Year’s Resolution Quiz helps you discover what area of your life you should focus on + gives you specific resolution ideas. Sign up below to take the FREE Quiz + get weekly tips to help you slay your goals in 2019. What’s your #1 tip for keeping New Year Resolutions? Take the New Year's Quiz! I personally gave up making resolutions years ago as they were always the same and I never achieved them leaving me feeling like I failed each year. I like the idea of mini goals though and making aims smaller and more achievable. Good luck with keeping to your resolutions! I don’t blame you, I’ve so been there, on both extremes – all for them, or just not into them at all. No one likes feeling like they’ve failed, but I find a well-selected resolution can be a motivating way to start a goal setting journal. I so love that you wrote a blog post about it, and publically shared it too. Way to get that public accountability behind you. Even I still haven’t really written a post on my personal goals as yet. Not that I don’t want to, just always ten other blog posts on my list to write about. One thing i practice and totally works is writing down my goals (even the daily ones). So glad that this post is a perfect match for you, Lakshmi! I feel ya, no one wants to feel bad, but I ask myself, what if it feels AMAZING when you achieve it? This is such a motivating post! I especially like tip 2 about setting R.I.G.H.T goals, specifically Resolve. For example, last year I set a goal of exercising each morning however my biggest challenge was actually waking up earlier. By shifting my focus to waking up by 6am each morning I was then able to begin tackling the task of incorporating exercise in my morning routine. I am all about the RIGHT goals (resolutions, actions all things RIGHT). I commend you, I can barely wake up decently early, much less at 6 am. That’s a really great example of pivoting your goals. It shows how aware you are of your real challenges. Yay for exercise too! I love the concept of creating S.M.A.R.T goals. It’s so easy to create unrealistic resolutions. I’m with you on this one, SMART goals really are a great way to get started with goal setting. Makes it more realistic! I always write my New Year’s Resolution. I would always go back to it at the end of the year to check whether I have completed / done it. That’s a great way to get started, Emmanuel! I know for myself, I am always amazed at the power of writing it down and how somehow I usually manage to reach them all. Hi gorgeous! Thank you for another inspiring post! You always brighten my day! Ah, resolutions.. Even though I did not commit to any this year I do have goals tp reach and having everything written down and taking it a week at a time really helps a lot! My planner is my best friend, it helps me stay motivated and have a clear plan in mind. You are so welcome, it’s my pleasure. hehhe, yessss resolutions! I find that people either smile or cringe at the thought of them. I’m all about the week! I can only worry about making it through 7, maybe 5 days at a time. Clearly thought out plan, and just action! You already know I love planners. These are some great tips for keeping a New Year Resolutions. I will definitely save this for my personal use. Now this is something that everyone should do to reach our goal! Thanks for sharing this wonderful idea! I’ll definitely gonna start doing this! Thanks for the blog post love. Hey, I am ALL ABOUT making sure that you can reach your goals. Happy 2018! The partner in crime one is super helpful! It’s not only easier, but way more fun too to reach your goals together. Helps keeping each other motivated! Aren’t they tho? Who wants to go after their biggest dreams and goals all on their own. We need a buddy! I know I need several haha. You are so welcome! Aren’t deadlines everything. I know I can never get anything done until I feel the deadline breathing down my neck. I just promise myself to be a better version of myself everyday. It’s not just on new year. Great list though. That’s a beautiful promise to make to yourself. Thanks for sharing. I have to admit that I never make new year resolution as it pressures me a lot and impacts my health. This year I’m only focussing on my healthy lifestyle! Not making resolutions might be a good thing, might not, it’s just all about what works for you. Whatever works, keep doing that. Living healthy is a great focus to have. I’m trying to add more of that to my lifestyle. These new year’s resolution tips are what I really needed! 2017 was a roller coaster ride for me and my family but it was one of the most amazing Christmas season ever! So glad it’s helpful for you over this busy, bustling season. May 2018 be just as amazing too! Great post, was looking for some ideas to kick-start 2018. The whole idea of setting attainable goals is key, I started trying to write down “SMART ” but hadn’t hear of “RIGHT”, I like it. You’ve got it. Attainable, achievable is what it’s all about. Well, you haven’t heard of it before because I created it. Reminds me I really need to write a blog post about it. These are some great tips. I like setting mini goals. I always feel so good when I reach them. Plus this helps me to stay motivated. This year I definitely want to get a journal. I need to get my thoughts out of my head on on some paper. Aren’t mini goals just the best. haha I seriously love them cute, and totally approachable versions of our big scary goals! Okay, this got me thinking! I was on that boat of thinking resolutions were bogus. I actually was on that boat long before anyone built the boat! I have always been for goal setting though. You do have solid points here and I am going to give resolutions another chance, next year lol. I resolve to give resolutions a try again in 2019!! hehehe I’ve been on that boat, and you must have been the captain! I find it’s so easy to just dismiss them as BS. I myself have set them and given up on them swiftly. Glad you’re jumping into the waters of resolutions. Let me know how it goes! Great tips for this time of the year. I try to make small goals that I know are attainable but things that I need and want to do. I love this time of the year for this very reason. That’s the way that I’ve found to be most successful. The big grandiose goal or resolution just leads to trouble. We might as well make it bite-sized from day one. It really is a fun time isn’t it!? Goal setting season. OHhhh, I am loving that idea. I too am all about the different categories in your life, except I try to focus on one main one that helps you achieve your #1 goal the most. And stickers! How cool is that, you had you at stickers. You really should join in with him. I just might give this a try. Writing down the goal is a big one for me. I tend to forget anything that I am supposed to remember these days. I also like the idea of celebrating the rewards along the way. There is no sense in not celebrating the journey, it helps get you to the goal! Agreed! It’s literally the first step, and I think it triggers something in our mind that makes us start believing its real. Who doesn’t love any excuse to pop champagne? I do! These are great tips! I don’t know that I make resolutions as much as I make goals. I don’t know if it’s a play on words, but making goals makes me feel like I have something I am working towards. I get that – it’s all about how you need to frame it for yourself, to make yourself take action. Goals does have a more make it happen feel, but even then a lot of people struggle to get it done. Ya know? Happy goal setting! I’m soooo bad at keeping new years resolutions that’s why I LOVED reading your post here! I really love tip #11 though. I did it last year and it really helps because it keeps everyone motivated. Thanks again for writing this! It’s superb! Hahha, don’t worry, I don’t think you’re alone on that – most of us are BAD at it. That’s awesome – motivation is everything in my book. Keeping a journal or planner is an excellent way to keep up with your goals and resolutions. My planner has a place for goal setting and it has be instrumental in me staying accountable to myself. OMG yes, who doesn’t love a journal and or planner to keep them focused on their goals or resolutions. I love how you’ve put it, it really is about being accountable to yourself! My husband and I made our resolutions together in the hopes that it will keep us accountable to one another for them. So far it is working. These are all good tips for making attainable resolutions. That’s just beautiful, I love that you’re making resolutions and goal setting together! He’s definitely already your partner in crime, so it’s perfect. I love these tips so much. Every year I create a New Year’s Resolution and within a week, I’ve forgotten about it. This year is different. I’ve been planning it for a while and actually started in early December. I’m excited to still be going strong and hope if I master this resolution that next year’s will be easier! Aww, so glad you’re loving them, Heather! Yeah, it’s super easy to completely space on what we’re trying to accomplish in the new year. Writing it down and reminding ourselves daily is super helpful with this. So awesome that you’ve gotten a head start on 2018. Why wait ’til the year changes to get started! Taking small steps and taking mini goals one step at a time is a good start. New Year’s Resolutions are hard to keep but listing them down and tracking them every end of the month works for me. I like the added tips, Nadalie! Thank you! You’ve guessed it, I’m all about making goals bite-sized to get going. They’re sooo hard to commit to, aren’t they?! We’ve got big eyes and try to accomplish so much but really can’t. Tracking helps us also review and make adjustments. It’s a great strategy! I called it a “Life Change” this year! We needed to as a family! Especially with time on electronics and running around! We are always on the go and we really need to slow down and enjoy! I love your “R.I.G.H.T. ” We actually sat down and talked about how this is going to be attainable. With two kids who have lot of appointments, a blogger, and a man in retail sales it is difficult. We need more family time and we can’t let anyone get us off track. Great article! Great tips on how to keep it going and what to ask yourself. Ohh I love that, it’s a powerful theme for your year. And it’s so great that you’re going after this together, with your loved ones. Hello, built-in accountability. I’m also trying to limit my own screen time, and spend more time in the real world. Especially, with all this time going towards my blog and business. Just too plugged in!